This banana smoothie recipe is tasty and highly nutritious. The ingredients are simple, but varying a few things can completely change the recipe. The bananas, water, and ice cubes can actually stand on their own as a delicious treat, but add something off the list of other fruit to jazz it up. The other great thing about the recipe is that it doesn't use any artificial sweeteners or fat, so it's all good. Dates, soaked raisins, strawberry, blueberry, blackberry, papaya, apple, mango. Throw the bananas into your blender. Depending on how much water you add to this, the consistency of the shake can vary considerably. If you like cold, throw in two ice cubes. I particularly like adding blueberries or blackberries, but all the other fruit adds an interesting element as well. Obviously, the stronger you want the taste of the secondary fruit to be, the more you should add. Enjoy your smoothie. It makes a fantastic daily treat. People are always asking me what blender to use to make smoothies, and I always steer them towards a vita mix. It produces a smoother consistency than any other blender blender I've used. It also doubles a food processor and a raw "ice cream" maker. Check it out. So you're making yourself a daily smoothie. Want to know how to expand the good habit into a diet? 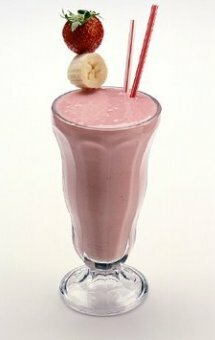 Read up on how to kick start a healthy raw food diet based around a banana smoothie.